By Joaquim Cardona, who is a Senior Internet business executive with broad experience in Internet business, digital marketing and mobile technologies and is the former Head of Digital at Barcelona FC. Joaqium will be speaking at FECKK 2017, sharing learnings from more than 20 years in the industry. Many of you may know about the Hype Cycle report that Gartner periodically publishes. In this report, Gartner, one of the most well-know and prestigious IT research and advisory firm, shows the maturity, adoption and social application of specific technologies. It always seemed to me that this is an interesting way of looking the state-of-the-art of the new emerging technologies, especially when they are in the Peak of Inflated Expectations and everybody is talking about them and finally they fall into the Trough of Disillusionment, before (in some cases) finally rising again once they reach a level of maturity. VR is entering fast into the Peak of Inflated Expectations as everybody is now talking about and first experiences are being tested (NBA, ManCity). In my opinion, Virtual Reality will be a game changer not only in sports but in our society: it will disrupt how we get fun, how we work and how we communicate. However, in the current technology stage it’s still too primitive (it lacks definition, smoothness and interactivity) and it’s still a niche for very early adopters. Probably in 3-6 years these limitations will be finally solved and I expect a huge adoption that will drive new revenue streams and opportunities. There’s some kind of pretty excitement with cord-cutting in the sports media rights landscape, but at the same time it’s so dangerous in terms of business model for sport organisations that it seems that we can only talk about it shyly. In the coming years, Internet will allow Sport leagues (or media rights holders) to disintermediate broadcasters and tackle the consumers and fans directly with a huge improvement of the revenues. But the change is so sharp and so impacting in the clubs and leagues profit and loss that nobody figures out how to make it without getting hurt. NBA, MLS and NFL have their own OTT platforms to experiment but in this side of the pond we are still looking at each other wondering who will step forward first. This is another cool thing we discovered in the last 12 months. Now that we have websites and apps, it seems that our users and fans want to chat with us using Facebook Messenger, Telegram and Skype. Personally, I still prefer to use an app or a website than typing to a still dumb bot, but in a few years, we can foresee human-like answers and reactions from the bots. 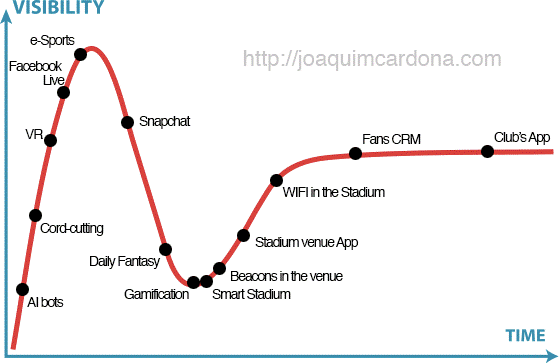 At the moment, I would invest my budget into some of the other trends (gamification, venue apps, CRM improvement). Clearly the buzz word everybody is talking about now is e-Sports. Still just a few Clubs have started their e-Sports initiatives, but it seems that everybody needs to have an eSports strategy nowadays. My thoughts on this are that it only makes sense for a football club to be in e-Sports if the video games are related to football. Maybe I’m wrong but, what is the value for a Club having these e-athletes playing League of Legends or Call of Duty? Facebook’s strategy to beat Youtube as the leading video platform is impressive. Facebook Live is becoming a great platform in terms of gathering audiences, taking advantage of the huge fan bases clubs have in Facebook and the extremely easy user experience: the live stream appears in the fan’s feed and starts playing: absolutely frictionless. But once again with Facebook, the issue is how publishers (so Clubs) can monetise their audience without pulling the users to their own platforms. Snapchat is sliding down quickly after being the rock star last year and getting the focus from major clubs searching for the new cool thing. The shiny success of Draft Kings and Fan Duel in the US raised high expectations and other companies rushed to apply the model to European football. Finally, Draft Kings and Fan Duel are struggling to merge into a single company and fight against some states restricting laws, and in my opinion they are losing momentum. However, Daily Fantasy will soon climb again following the “Slope of Enlightment”, so stay tuned. Another universal remedy that was supposed to change everything and finally only a few (if any) really applied it successfully. I’m a strong believer of gamification as a fan engagement strategy (to be honest, I’m currently addicted to Clash Royale because of its exquisite gamification), but it’s really, really hard to implement it well and requires lots of work and to re-think the complete interaction with your fans. Once again, gamification is not dead but a little bit burnt because of the expectations it raised. If you have the resources and you are brave enough, I recommend you to invest in a well-designed and meaningful gamification strategy for your fans. After being the big hype in 2013 and 2014, sports marketers and technology providers had to face the challenge of moving from Powerpoints to reality, thinking the best approach in real life cases. There’s still a lot of recycled technological waffle under the umbrella of the Smart Stadium concept, with the old blue chips trying to sell the old things with new names. The challenges now are: effectively provide a consistent and cross-platform (web/app/wifi) single sign-on and translate the massive social graph data to something useful from a business perspective. Previous ArticleReview of Drone Expo 2017, Saturday 11th March.